Economic slowdown, sliding stocks, plunging oil prices, closures and layoffs. Read any reputable financial publication and it seems you have no choice but to accept the fact that a total economic meltdown is on its way. Is there any good news in all of this gloom and doom? Yes. There is a sector gaining momentum around the world—the marketplace lending industry. Whether you are an investor or consumer, marketplace lending, or peer-to-peer lending, offers financial rewards not be found elsewhere. In a nutshell, peer-to-peer lending is an online platform whereby borrowers are matched up with investors for an easy, streamlined, and quick process of accessing loan funds. It is one of the two fastest growing online funding platforms that make up what the industry terms “marketplace lending” the other being crowdfunding. While crowdfunding is geared toward the funding of ideas, projects and new businesses, peer-to-peer is geared toward the funding of hard-core consumer needs, such as paying medical bills, consolidating debt, remodeling the home, getting married, or taking a vacation. 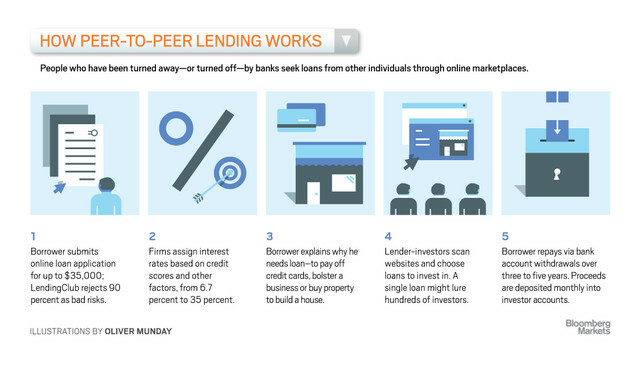 Peer-to-peer has become THE preferred lending platform, especially among millennials and others who operate in a digital world. For them, online accessibility, speed and ease are of the utmost importance. Millennials, who make up roughly 25% of the current American population, and hold more than one trillion dollars in buying power rarely interact with banks. Surveys reveal that they do not even maintain a savings account with a bank. The online financial industry fits perfectly into their paradigm, making peer-to-peer platforms especially attractive. Peer to peer is also a resource of choice for those shut out by requirements for exceptional credit ratings. Banks have less money to loan, so the eligibility bar has been raised. Peer-to-peer platforms have developed creative and more accurate eligibility-determination tools that are more organic and examine a number of factors in order to determine an applicant’s creditworthiness. Further, with an automatic mechanism for loan repayment, P2P lenders are in a position to offer loans to consumers whose FICO score falls more in the medium range. What is sustaining the peer-to-peer lending market? While all the signs are in place for a slowing economy, consumers still need loans. People are still buying homes or looking to remodel and expand their existing home. People still want to take a vacation. People are still getting married. As the medical insurance industry becomes more and more restrictive, consumers find themselves with more out-of-pocket or uncovered medical expenses. Some medical procedures are necessary, but considered optional by insurance carriers. People need loans for this. People are moving—for better jobs or to a better neighborhood. This costs money. Very few people have savings accounts, most are living to the maximum borders of their budgets, if they even have one. And then there is consumer debt—high credit card balances, huge student loans, mortgages, piles of bills. P2P lenders have become a helping hand to the consumer looking for a way to get out from under his pile of debt and into financial freedom. On the international scene, peer-to-peer has taken off like wildfire. Even though the industry has its origins in America, peer-to-peer is growing at an even faster rate in other countries. For instance, in the UK, according to the Peer-to-Peer Finance Association, more than £2.2 billion was loaned through P2P lenders in 2015. This is twice as much as 2014. The number of peer-to-peer lenders also grew, by as much as 22 percent over 2014. And, rounding out the picture, the number of UK peer-to-peer borrowers almost doubled in 2015 from the previous year. Peer-to-peer has been spreading across Europe and Asia, and made its debut last year in Canada. For developing nations, especially those experiencing geopolitical unrest, peer-to-peer offers citizens an opportunity to safely interact with a financial institution for the first time. Peer-to-peer lenders in these countries give women financial empowerment and independence. All around the world, peer-to-peer is changing the financial scene. Peer-to-peer lenders are financed by investors—private individuals as well as institutions. In a rocky economic marketplace with lower yielding stocks and trusts, peer-to-peer platforms offer investors a better return, on average between 5-9 percent. A high level of transparency creates a level of comfort for investors. They control how much to invest and the level of risk they want to take on. Investors have the option of letting their money accumulate or to be reinvested. The mega success of the industry, especially following a couple of very high-profile public offerings, caught the eyes of investment portfolio managers at major financial institutions too, and now many peer-to-peer platforms have almost an equal number of institutional and private investors, further strengthening what already looks like a dynamic industry.